Corn pudding looks delicious Priya. Corn pudding looks yummy and delicious!! Very nice recipe and pudding looks yummm!! I love corn n this looks amazing! New and amazing dish..love the color! What a great dessert...I've never had sweet corn pudding, only savory. This looks delicious! 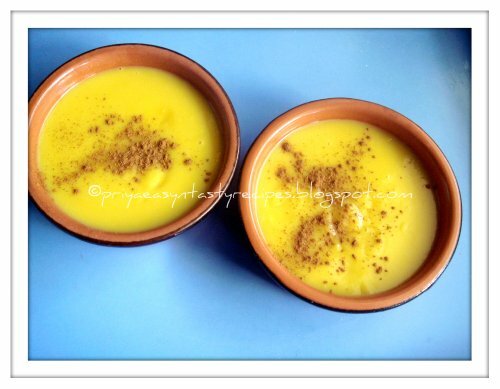 corn pudding looks yummy n creamy.. love t color of it.. simple dessert to try..
Looks delicious and pretty pudding..
Nice to learn about a new pudding esp from brazil. A very hearty pudding, I love the colour of the pudding. This is a nice way to use corn aside from making it into soup. Very nice idea. New to me nice recipe. Do send it to my AWED Brazil event. thanks. Nice recipe,sounds interesting and delicious! easy yet simple recipe priya...nice colourful click!!! Priya Yaaru ivvallavu sweet sappidara unga vittula? Corn pudding looks great. I have sent your brazilian coconut kiss for the bookmarked recipes event. It came out nice. Thank you for the recipe. The corn pudding's colour is very nice! It's flavourful too! lovely colour and interesting !! That sounds interested, yet tasty! Nice one! Corn pudding looks creamy & delicious.Lovely colour.